Visitors at the inaugural Singapore Mini Maker Faire would probably remember a booth with a digital ‘Like’ counter tied to poles as well as the adjacent booth with electronic kits for kids. The digital counter was controlled by an Arduino, an open-source platform that allows people to build their own gadgets while the electronic kits are for younger children to start tinkering with electronics as they are less intimidating. The booths belong to friends Adrian and Wai Him, both makers and hobbyists. Many visitors to their booths discovered that the electronic kits and Arduino are fantastic platforms for their children to pick-up electronics in an interesting way through experiential learning. Adrian and Wai Him shared with me something once said by Benjamin Franklin, one of the Founding Fathers of the United States, that a person may forget if he was simply being told. Hence, this explains the title of this blogpost. Adrian and Wai Him are guided by the belief that a person may remember if being taught (such as using additional visual aids like powerpoint), but the real learning occurs when the person is involved through experimentation and play. What makes you return to the Mini Maker Faire? A & WH : This event is a good opportunity for the general public to have a better understanding of the Maker Culture. By soaking in the atmosphere of Makers, Dreamers, Creators and Builders at the Maker Faire, people would be inspired to start making their own creations and hopefully in turn enrich their lives. What was your experience like during the last Maker Faire? Did you notice any trend among the people interested in your booth and your gadgets? Were they people who are already into electronics or novices? What did it feel like sharing your experience with electronic gadgets? A & WH : Some visitors had never heard about the ‘Arduino’ & the maker movement. After sharing, they seems motivated enough to go explore further. Some had heard a little about ‘Arduino’ but don’t know how to take the first step. We’re heartened to have interacted with many parents at our booths who wished their child can learn electronics and have fun along the way. Did you think the Maker Faire was useful to the maker movement here? Did you see any changes since then? A & WH : Yes to both. There has been impact especially to those who are already aware and searching around for the community of makers locally. One of your Science Centre colleague William Hooi has been very active in the maker community and generating interest in the maker scene. More should be done to raise awareness in the maker movement. This is a good platform for science centre to reach-out to the public and schools and make learning science and technology fun by leveraging on the diversity of ideas of the maker community. What are you intending to showcase this time? A & WH : Like last year, our concept is still to bring across the message ‘Start your Maker journey one small step at a time. In time to come, you’ll look back and find you’ve taken a giant leap’. We will extend our showcase based on last year. So we’ll still show the ‘Like’ counter. To show what it was last year and how it has evolved this year. We’re also planning an interactive light or sound display that is controlled by participants at the booth (eg using distance sensors). In addition to introducing and selling electronics/hobbyist parts and kits, we’re planning to conduct experiential learning workshops in electronics, Arduino and Arduino robotics. What are your expectations from the second Mini Maker Faire held in Singapore, and what would you like to achieve out of it? A & WH : We hope that the second Mini Maker Faire brings more people together (compared to last year) and raise more people’s awareness on the maker movement. Would you have any advice or words of encouragement to give to newcomers at this year’s Maker Faire? How about advice to people who are new to electronic gadgets? A & WH : For newcomers, do not worry that what you have to share is simple or easy. The simplicity could be the motivating factor for some people to start their Maker journey. For people new to electronic gadgets, take a look at our website (3egadgets.com) and come over to our booth. Meanwhile, they can look up the internet to see gadgets that people can make themselves and go to the library to borrow some good books on basic electronics and Arduino. Wai Him also penned his own entry for our blog last year. If you are interested, simply click on this link. To see Adrian’s entry in our blog, simply click on this link. There were many maker booths at the inaugural Singapore Mini Maker Faire last year but Ling Ling’s booth stood out from the rest because her projects were of a different nature from the majority of the other showcases. 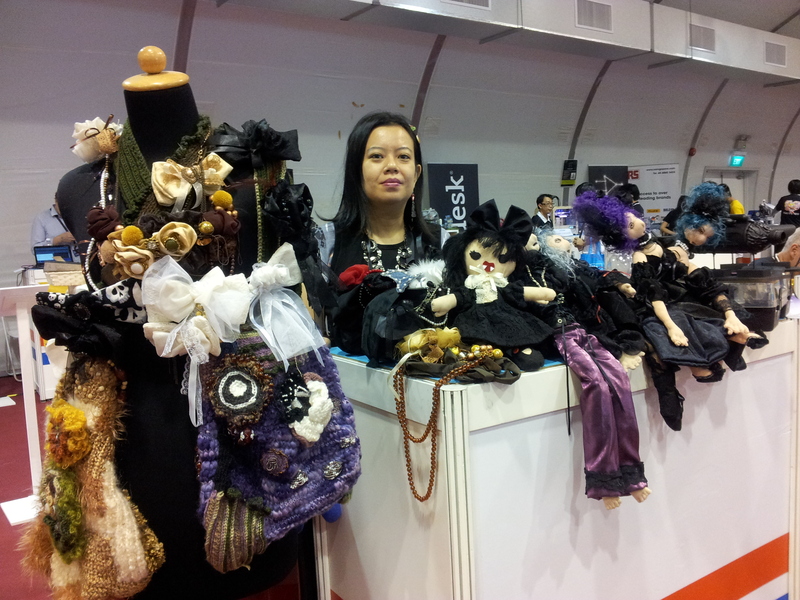 Instead of electronics and robotics stuffs, Ling Ling was showcasing her beautifully crocheted bags and gothic dolls. I was excited to know that Ling Ling is returning because I am an innate craft lover and I am drawn to anything crafty. Hence, I was very curious what she will be showing this time round. It turned out that Ling Ling intended to run a workshop on top of showcasing her work at a booth! Read on to find out the motivation behind her return to the Singapore Mini Maker Faire. One takeway from last year’s Faire for Ling Ling was the network with other fellow makers, who continued to connect online, at Maker Meetups and similar events. So, if you have been a lone maker who would like to know more like-minded people, why not drop by this year’s Singapore Mini Maker Faire? Lastly, here is a word of advice from Ling Ling to all newcomers at this year’s Singapore Mini Maker Faire. Ling Ling’s passion for crafts and the Maker Faire drives us as well, and we hope to bring in more makers from different background and expertise so that there can be more sharing and learning through exchanges between makers. If you are interested in the previous blog we had posted about Ling Ling, you can read about it here. Her works can also be found here. Update: Ling Ling will be conducting an “Intro to Crochet for Beginners” on 28 Jul, 12.45pm – 1.30pm, at SCAPE Level 4 (Colony Room). No pre-registration required, slots on a first-come-first-served basis. Please make payment at the SMMF Counter at the Colony to confirm your slot. As a lead-up to this year’s Singapore Mini Maker Faire on 27 & 28 July, we went round consolidating advice from some of the repeat makers which they felt are useful for new makers or makers wannabe. 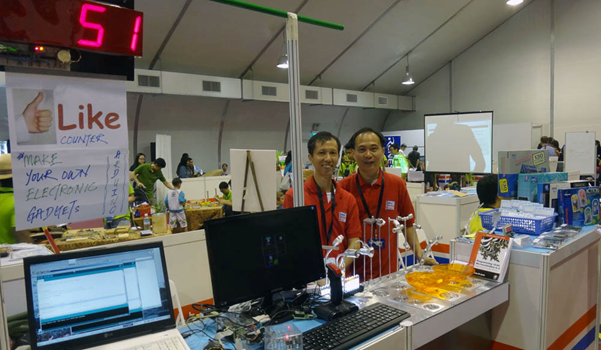 Ken conducted a workshop at the inaugural Singapore Mini Maker Faire held at the Science Centre Singapore last year. Like many others, I was awed by Ken’s project. He was working on animated paper-craft with wireless inductive power transmission. Click here to read more about his project showcased last year. This year, Ken is returning to the Mini Maker Faire to help his colleague instead. He shared that he really enjoyed the event last year, where the smiles on people’s faces after seeing his work encouraged him to come back again this year, even though he will not be taking a booth this time. Ken shared that last year, he had 30 sign-ups for his workshop and many of them were children. He was motivated when the children left the workshop being happy with what they had learnt. 1. Don’t get panic if too many people come to your workshop, although you may not have enough for them, because that means you have done a great job, and people are really interested in your work. We will post a separate blog entry later on the booth by Ken’s colleague at the Singapore Mini Maker Faire this year. Watch this space for more updates on the Singapore Mini Maker Faire 2013! Just another 3D printer? No, it is slightly different this time. Introducing next is another repeat maker from last year’s Singapore Mini Maker Faire – Wee Kiam Peng. If you cannot recall who he was, he is the person behind Orangeknob and the portable self-replicating 3D printer “Portabee”. When approached to give some words of advice to people new to the making culture, Kiam Peng amazed me with his super fast response. Every single answer was sharp and straight to the point. Kiam Peng shared that he had signed up again as maker this year because of his passion for making. Interestingly, he described last year’s Mini Maker Faire as “crazy” but in a positive way. It was meeting a lot of like-minded folks that made it “crazy” for him. I guess he must have found himself being approached to find out more about his 3D printer most of the time. He felt that the Singapore Mini Maker Faire does help encourage the maker movement and the interest in 3D printing here in Singapore. In fact, he highlighted that every little steps help. How true indeed! As repeat makers, Kiam Peng expressed interest to see a greater variety of DIY items. I guess this would always be something that most makers like to see – “to inspire and be inspired”. Hence, Kiam Peng urged all makers to be more forthcoming, to dare to show the world that you are creative and that you can make a difference. We were excited when we hear of the giant 3D printer that Orangeknob is going to showcase. How big would it be? What kind of prototypes can it print? I believe many people at the upcoming Mini Maker Faire will be similarly curious about it. Ideas and possibilities never fail to bring up the spirit in people. Does the sound of this giant printer perk you up a bit and ignite your interest? To learn more about Orangeknob’s latest project, check them out at the Singapore Mini Maker Faire 2013, coming to you on 27 & 28 July at SCAPE. If you are keen to read more about how Orangeknob was formed, read our blog entry last year here.